1) Reliability - Nexternal has an amazing track record for uptime. 2) Expert Customer Support - When you have your own account manager, the days of calling and waiting on hold are done. 3) Branding - We customize the online store to fit with your brand - no templates here! Bandwidth Unlimited. No additional charge for high bandwidth consumption. Limited depending upon plan. Merchants charged extra when limit is exceeded. 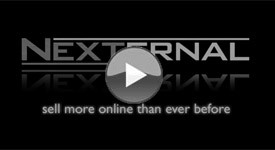 Watch the Video Site Sync performed by Nexternal Design Engineer During Setup. Merchant can choose template, or pay extra for custom design. Loyalty Program Yes. Native to online store and mobile point-of-sale system ($). Available in Pro and Premium Package. Online store only. Watch the Video Yes. Conforms with Schema.org Product format. No. Watch the Video Yes. The zoom works well on both traditional and tablet computers. Works well on traditional computers, but not on an iPad. Watch the Video Yes. Create UPS, FedEx, or USPS Labels from Order Management System. Can Create USPS and FedEx Labels. UPS integration via WorldShip. Watch the Video Yes. ($) No. Watch the Video Dedicated eCommerce Account Manager with an average of 8 years of eCommerce experience. Free unlimited support. Dedicated Ecommerce Consultant. Free unlimited support. Watch the Video Yes. Mobile Friendly Catalog & Checkout. Mobile Friendly Catalog, but Checkout Screens are not mobile friendly. Watch the Video Yes. Sell products on Amazon.com. Automatically pull orders into Nexternal. Yes, gold level plan or higher. Watch the Video Yes. Recurring Orders. Yes. Only Subscription Billing. Turn Key Order Integration with Leading ERP and Accounting Systems Yes, using TrueCommerce Connect ($) No. Multi-Warehousing & Directed Fulfillment Yes. Track inventory at mulitple locations. Intelligently determine best ship-from location. ($) Not Available. Dashboard Plus for iPhone/iPad Yes. iOS Dashboard app not available from Volusion. Single Click Reorder Yes. No. Currency Converter Currency rates are updated automatically every night. Currency rates must be updated by merchant manually. Sales Tax Nexternal tax tables are updated automatically monthly. Also integrated with Avalara. Tax rates must be entered by Merchant. Query Customers Based On Order History Yes, you may create customer lists based on order history and export or email those lists. No. Support for FedEx® SmartPost Yes, Rates and Labels. No. Google Merchant Center Feed Yes, Nexternal automatically FTPs a Google Merchant Center file daily. The Google Merchant Center File can be created, but must manually be sumitted by merchant. Suggestive Search Yes. Nexternal's software can display product names as consumer enters search terms. No. USPS Labels with Postage Yes, Nexternal has integrated with Endicia's web services. Merchants must export and import data to Endicia. Coupon Codes Passed in URL Yes, Nexternal makes it easy for consumers to activate coupons via special links. Consumers must enter coupon codes. Product Names wrapped in H1 tags Yes, this is great for SEO. No. Customer Types Unlimited. Price products, control visibility, allocate products and specify billing options by type. Limited to 5. Price Product by Customer Type. Volusion is a Trademark of Volusion, Inc.
Information was collected from Volusion's website (www.volusion.com) in order to compare it to Nexternal's eCommerce application. To report an error or discrepancy, please email .